Katie tweeted a few weeks saying that if she could make one food zero calories for the rest of her life, it would be peanut butter. I concur 100 percent, of course, because I love peanut butter. I eat it every day. The rate at which my household consumes the nutty food of the gods might some people blush. But I take it as a point of pride. I've actually been on a quest for the perfect peanut butter for some time, and am very thankful for a series of glorious recent events. In my odyssey, I was searching for a product that had the right flavor and texture without a bunch of junk in it. Just peanuts and salt, please. 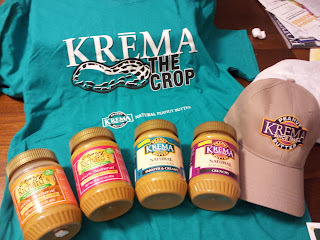 I tried jar after jar before finding the ambrosia I was looking for in the form of Krema, an all-natural variety made in Ohio from one specific type of peanut. And that's in. No crap, no oil, nothing. I may not have found calorie-free peanut butter, but this goo is worth every delicious calorie. It is a healthy fat and has no added oils, which is why every jar requires a bit of stirring to combine all the good stuff into the creamy concoction we all know and love. Hence the company's slogan, Stir for Your Health. After I tasted this spreadable piece of heaven, I tweeted and e-mailed the company my praises. These compliments don't come lightly, since I've eaten my way through all types of jars at the supermarket and specialty foods stores. So why am I so thankful? The company sent me a box of the stuff, which was just as awesome as winning the lottery in my household. So get ready, readers, for all kind of peanut butter recipes. We're in for a delicious ride. I love peanut butter too! I need to try that brand. Thanks for your input. I think we need some PB goodies at our next meeting. On top of frozen yogurt. That looks SO tasty! Ok this may sound weird...but peanut butter and Cheese Dorrito sandwiches are AMAZING. (Nothing like adding some junk chips on a PB sandwich haha!) Weird but delicious, trust me!